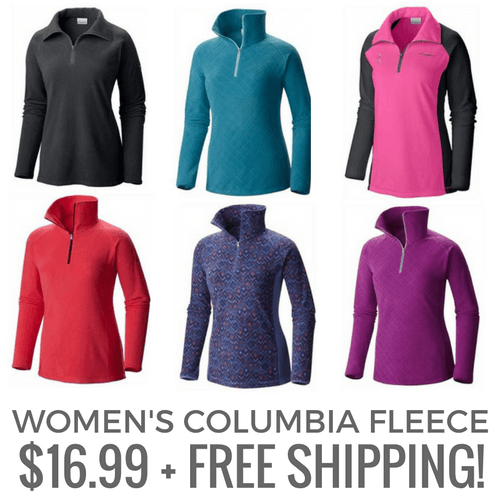 Women's Columbia Fleece Pullovers Only $16.99 + Free Shipping! Home / Deals / Online Deals / Clothing Deals / Women’s Columbia Fleece Pullovers Only $16.99 + Free Shipping! WOW! I have seen Columbia Jackets this low, but only in Kid’s and Baby Sizes! If you hurry, there is a new coupon code you can use at Rakuten to get Women’s Columbia Fleece Pullovers for only $16.99! I am not sure how long this code is valid, so I would order soon in case it is gone quickly.